You will be given a reference e-book to read which has 520 pages And the test will be based on that e-book , you can take final test within 1 year of purchase. HTML5 refers to a markup language which is primarily designed to help you easily structure and present web contents. It is one of the core internal technologies proposed originally by the Opera software. One of its major objectives is to enhance the language while also supporting the most recently introduced multimedia and making sure that the language continues to be easily readable by humans. It also works in ensuring that the language can be understood consistently by useful devices like parsers and browsers and computers. It should be noted, however, that HTML5 is not actually a software which requires installation. It is the newest version of the HTML language. If you want to use it, then you have to make sure that your web browser supports this version to guarantee the correct display of web pages with the help of its functions. HTML5 can also be expected to offer numerous benefits and remarkable features to its users. Among the many benefits that you will surely enjoy from this markup language are the reduced need for external plug-ins such as Flash, offers better ways of handling errors, provides more markup as a means of replacing scripting, it is device independent and more visible development process. You will also get the chance to enjoy its most useful features including the canvas element which is primarily designed for 2D drawing, audio and video elements designed for media playback, local storage support, new form controls including date, email, time and calendar and new elements that are content-specific. Learning HTML5 is no longer that hard at present because Brainmeasures, which is a well-recognized online certification company, is now offering an impressive HTML5 certification; course which is guaranteed to help in providing you all the information that you need about this specific markup language version. The comprehensiveness of this HTML5 course is one of its most striking qualities. Enrolling in this certification course makes it possible for you to undergo a comprehensive HTML5 training which is guaranteed to work in supplying you with all the information that you need to become a real expert in the field including the definition of HTML5, basic procedures involved in starting to use it, the newest features that are installed in it and its most remarkable benefits. 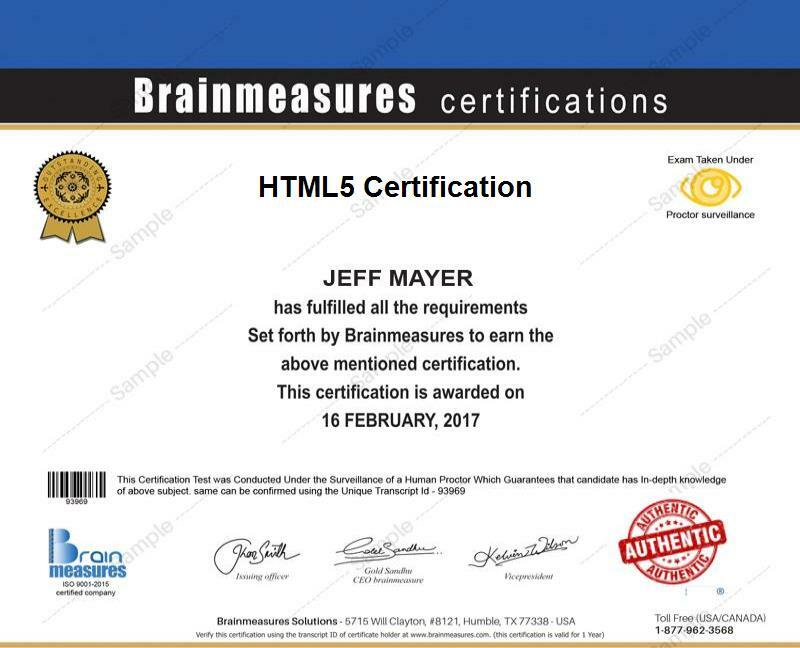 Getting your certificate in HTML5 from Brainmeasures is indeed a huge help in your attempt to strengthen your background in this specific field. Enrolling in the HTML5 certification program offered by Brainmeasures is indeed a move that can offer you a lot of benefits if you are an aspiring HTML5 expert. You can expect it to work more suitably for all existing and aspiring web and mobile developers, programmers, administrators, consultants, IT professionals and any other individuals and professionals who longed to obtain a deeper understanding about HTML5 and its most remarkable features. Finishing up your HTML5 certification course is also financially rewarding because of the higher level of salary that the positions that you may fill can offer. With your HTML5 certification around, it will be easier for you to work as an HTML5 systems administrator which usually offers an annual pay of around $66,000 to $92,000. You also get the chance to work as an HTML5 web developer which usually offers around $77,000 to $125,000 annually.